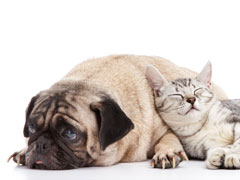 Oral surgery can improve the quality of life for companion animals. In some cases, oral surgery may be life saving. Oral surgery may be needed for dental problems requiring extractions, foreign bodies, jaw fracture repair, maxillofacial reconstruction, oro-nasal fistula repairs, oral tumor treatment, palatal defect repair and periodontal disease treatment. With recent developments in providing balanced anesthesia and incorporating newer analgesia (pain management) techniques, virtually any of the oral surgery procedures can be performed with minimal patient discomfort. Dr. Kressin works directly with internal medicine and emergency, critical care specialists to provide optimal patient monitoring during the recovery period. Pain management, nutritional support and excellent nursing care are fundamental to optimal recovery from major oral surgery. Feeding (esophagostomy or gastrostomy) tubes improve nutritional support for the patient and allow for easier administration of medications. Additionally, feeding tubes help prevent damage to the oral surgical site by eliminating the need to manipulate the mouth to provide oral medications. It can be very difficult for pet owner's to make the decision to choose oral surgery for their companions; however, these decisions are typically very rewarding for them. The purpose of this webpage is to help owners with difficult decisions and to provide useful information.